I had a pretty busy feeding schedule this past January, going out for 13 big dinners during the month in the days leading up to a gourmet trip to Tokyo - including being out 5 nights in a row during a particular week. So when I found out about the pop-up dinner at the Landmark Mandarin Oriental with Chef Diego Muñoz from Astrid y Gastón in Lima, I really struggled between wanting to try something totally new and foreign to me, and my strong desire to keep my calorie intake in check. In the end I passed up the opportunity, and looking back I kinda wish I hadn't. So when the announcement came about another pop-up with a Peruvian chef, this time featuring Virgilio Martinez from Central - currently No. 1 on Latin America's 50 Best and No. 4 on World's 50 Best - I didn't hesitate for a moment. I immediately rounded up a couple of my reliable eating partners, and ultimately ended up with a table of 8. As usual, we gathered at the Amber Bar for cocktails and canapés. Virgilio was on hand to prepare one of the canapés while the rest would come out from the kitchen in rounds. Tonight's dishes are taken from two of Central's tasting menus: Mater Elevations, featuring ingredients found at specific altitudes; and Mater Ecosystems, featuring ingredients coming from a specific regional ecosystem within Peru. One must admit that the concepts are very interesting. According to Virgilio, there are 7 people at Central who don't do any cooking, whose jobs are to travel to different parts of Peru - up the mountains, for example - in search of ingredients. He gives us a couple of statistics to illustrate the biodiversity of his homeland: there are over 4,000 different kinds of potatoes and over 170 different types of corn. He stresses that they don't do "seasonal cuisine" because of the wide variation in climates across different regions of Peru. Their cuisine also isn't "local" as they come from all corners of the country, although each dish is contained within a specific ecosystem. River scales (elevation 180 m): river snails, gamitana, sangre de grado - thin slices of raw tambaqui (gamitana) are served on top of chia crackers. The orange paste is made with the sap of the sangre de grado tree, which is purported to have medicinal benefits. Interesting but kinda bland. High altitude rainforest (elevation 860 m): yacón, smoked duck, zapote, nasturtium - there was supposed to be duck wrapped in the nasturtium leaf together with the yacón, although I couldn't for the life of me taste any... The yacón had a similar texture to yamaimo (山芋) or jicama, and thanks to the nasturtium and other leaves I tasted green flavors that reminded me a little of freshly-ground wasabi, but without the kick. I'm guessing the dab of yellow coulis is made with zapote. Spiders on a rock (elevation -5 m): sargassum, limpet, crab, sea snail - this looked very pretty with what looked like perilla flowers. The crab and limpet snail were served on a cracker lined with some kind of kelp (which didn't look like sargassum), and topped with some sour cream. Tasty. Corn diversity (elevation 120 m): corn, honey, pacae, tumbo passion fruit - this came in essentially three parts. First there were toasted corn kernels which were crunchy and yummy. Then there was the "ceviche" of corn, which was kinda sour as I poured it into my mouth. I wonder if the acidity comes from the tumbo. Nibbling on the crunchy ring afterwards provided a nice little sweetness for balance. Third part were these "tablets" on yet another crisp, topped with corn silk. 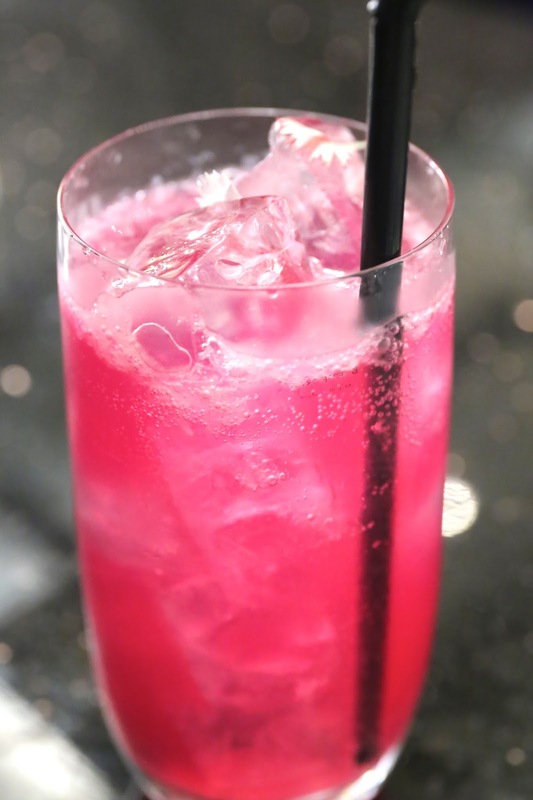 Chilcano - made with pisco and ginger ale. Surprisingly sweet, and somehow reminding me of grenadine... maybe because of the color from airampo. Pisco sour - funnily enough, this wasn't the least bit sour. Pretty tasty, actually. Scallops and black corn: scallops, black corn, sprouts - the raw chunks of scallops came with an acidic sauce - I suppose like a ceviche... There were denser wedges on top made with black corn, as well as a crispy wafer on top. Garnished with a few sorrel leaves on the side. Pretty good. 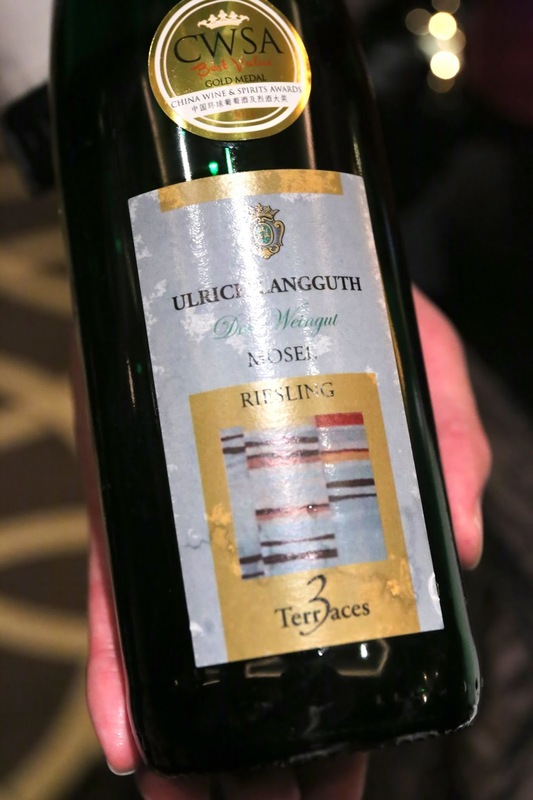 2012 Ulrich Langguth Riesling '3 Terraces' Trocken - mineral and toasty on the nose. Full-bodied, ripe on the palate and dry on the finish. Marine soil (elevation -20 m): razor clams, sweet cucumber, lime - certainly one of the highlights of the evening for a few of us. One can taste the sweetness of the razor clams with just a hint of brine, which again came with an acidic sauce - this time made with lime. The chunks of clam were enveloped in a "shell" made of thin slices of sweet cucumber (pepino dulce). Very yum. 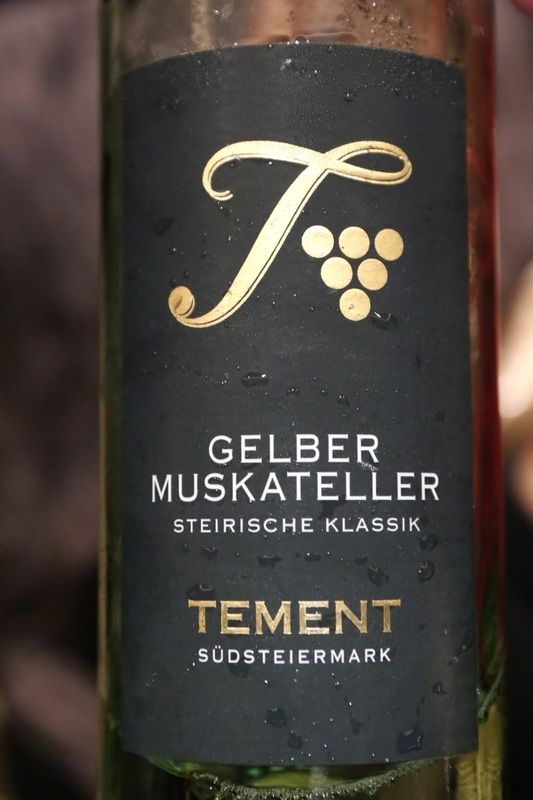 2010 Tement Gelber Muskateller Steirische Klassik - completely muscat grape... pretty ripe and sweet. Love it. Very well paired with the dish. Amazonia colors (elevation 400 m): doncella, bahuaja nut, pijuayo, huito - originally meant to be made with doncella, but there were issues with importing the fish, so I was told that French sea bass was used... and dyed red with airampo seeds. Served raw and slightly chewy, this came with a green sauce made with a mixture of herbs, a purple sauce made with huito, and some garlic mash. On the left side you've got foam made with bahuaja nut, topped with a crispy lattice made with peach palm (pijuayo). 2011 Jean-Philippe Fichet Meursault -a little oaky, ripe on the nose, and also ripe mid-palate with a dry finish. Valley between Andes (elevation 2190 m): avocado, tree tomato, kiwicha - I'm usually not a fan of avocado, but I didn't mind having this warm dish made with them. The strong acidic sauce was jus made with tomatillo and shrimp. The thin wafers were made with seaweed, and there was a generous sprinkle of kiwicha. I really liked the flavors and texture of the kiwicha. 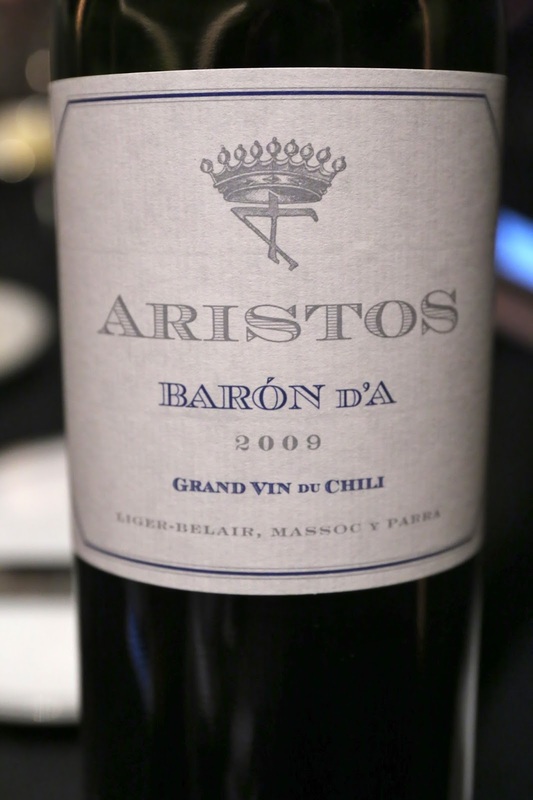 2009 Aristos Baron d'A - very fruity and sweet, jammy, fragrant and woody. A little alcoholic on the nose. Still kinda tannic here but there's enough acidity for balance. Low Andes mountains (elevation 1800 m): quinoa, veal, airampo - apparently the dish was inspired by the colors that people paint themselves with, and it looks like some of the quinoa was dyed red with airampo. The cows eat the quinoa leaves, so Virgilio dyed some of the quinoa green with the leaves. The cubes of veal were honestly too well-done and therefore a little on the dry side for my taste, so it was best taken with the milk infusion. The milk was infused with herbs which were collected from an altitude of more than 4,000 meters, and left for at least an hour to deliver a slightly nutty flavor. There was also a piece of dried milk crisp along with some amaranth. The Great One said that this was the most delicious quinoa she's ever had. I would have to agree with her. 2011 Château des Fines Roches Rouge - very fruity with nice leather notes. Amazonian rainforest (elevation 650 m): rose apple, pitahaya, lemon grass, sweet pepper - just looking at this dessert makes me happy... All the bright red (from pomarosa) and yellow hues just perk me up. And the sweet (but not too sweet) flavors were really refreshing. 2011 Joh.Jos. 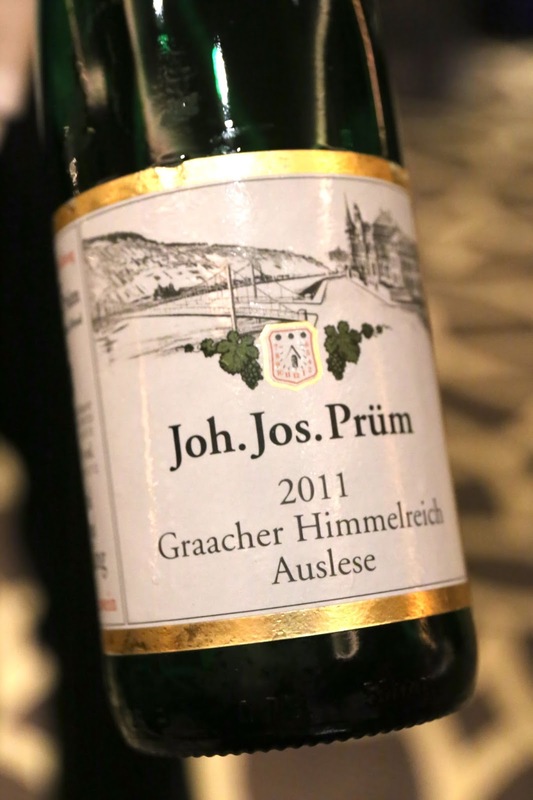 Prüm Graacher Himmelreich Riesling Auslese - classic nose of petrol and plastic. Surprisingly not too sweet on the palate. Green highlands (elevation 1050 m): lùcuma, cacao, chaco clay - we've got blobs of chocolate at the bottom (which looks a little likelike mud), along with some wafers made with lùcuma, and topped with shavings of white chocolate that's been mixed with edible chaco clay. Visually this invokes images of barren earth, despite the presence of a few leaves. Tastes pretty good, too. 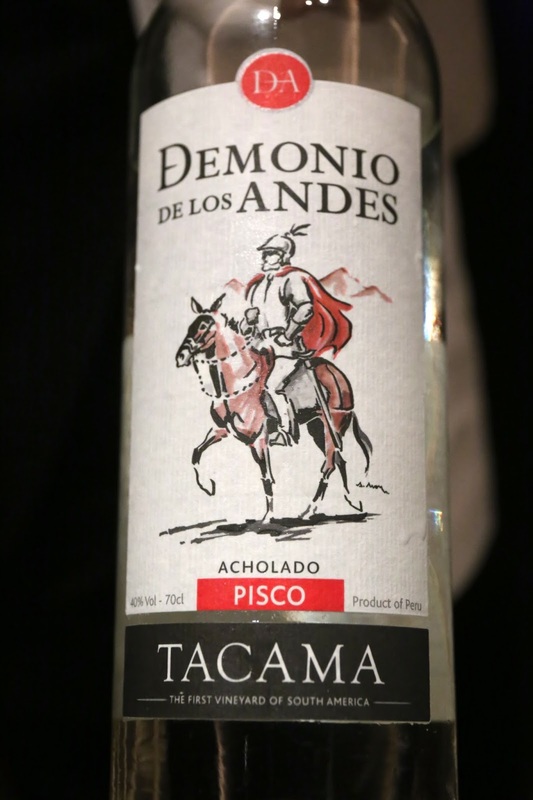 Demonio de los Andes Pisco - some tropical and banana notes reminiscent of some sake. This was undoubtedly one of the most interesting meals I've had this year. Most of the ingredients were completely foreign to me, and as someone else wrote about his meal at Central, I had to look up the majority of the ingredients since I'd never even heard of them. I also like the entire philosophy behind the way dishes are constructed, and this was a real revelation for me. However, as I reflected on the meal later, I could just as easily level the same type of criticism I used for my meal at Noma Tokyo: most of the dishes were cold (only two out of seven dishes were served above room temperature), and there was plenty of acidity in my food (three of the seven dishes had very noticeable acidity). So I was a little torn about how much I really enjoyed the taste of the food, given my general dislike for food with a strong acidic profile. In the end, though, I was still a happy camper for having had my eyes opened.